An HDMI cable features a specific design that allows for the best state-of-the-art picture quality for today's 1080p and 1080i televisions. The audio and video cables work with a wide range of different electronics that you already own. HDMI cables allow for excellent audio and video quality for even the largest and highest resolution TVs. Audio cables give you the chance to connect a laptop, personal computer, video game system or any other electronic device to your HDTV. 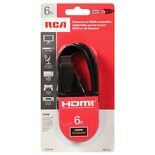 An HDMI cable will work for both audio or visual needs, as both the sound and video signal are sent through the HDMI cable unlike traditional A/V cables. These cords are especially important if you want to connect one component to multiple televisions around your home. Choosing HDMI cables should be an easy task, but you must know what you want before you start shopping. An audio/video cable is best if you want to connect an electronic device to your television without using multiple cords. You should also pay attention to the length of the cord. HDMI cables come in several different lengths, and if you pick a short cord, you might not have enough space for connecting the device. Always check the output on your electronic before buying a new cable. If the device has more than one port on the back, you might need multiple cords, including an auxiliary audio cable.